Luke has another excellent product in the StandStand Grand. This one is somewhat less portable though far more ergonomic. The look of the bamboo model is impressive and fits in many decors. Note that this is not an adjustable desk. The StandStand Mouse is a very nice portable sit-stand desk. Note that it is not adjustable and you need to order the correct height for your personal height. It looks excellent and is easily portable. The additional space over the original StandStand is excellent for those who want to use a mouse with their laptop. This is the most portable StandStand in the lineup. I literally put it in my carry-on when I'm traveling so that I can stand up at the airport or in my hotel room. It is quite sturdy and stable but only holds your laptop. The StandStand is extremely portable and I literally took it with me in my carry-on during a recent trip. It fit in my bag easily, since it packs flat, worked great at the airport, as well as in my hotel room. The StandStand Mouse is one step up in width, allowing enough room for a small or medium laptop and a mouse. This is an excellent product if you need portability and use a mouse, like me. 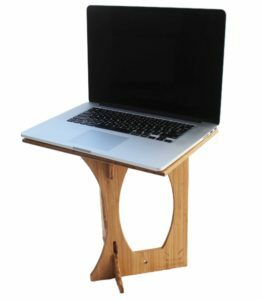 The StandStand Grand is a multi-level standing desk with riser, allowing you to place up to two monitors, use a keyboard and mouse, or your laptop on the lower level. It too is really portable, it’s primary feature, though it does move around some when you use it. An unstable monitor stand will result in monitor movement when you use this desk. 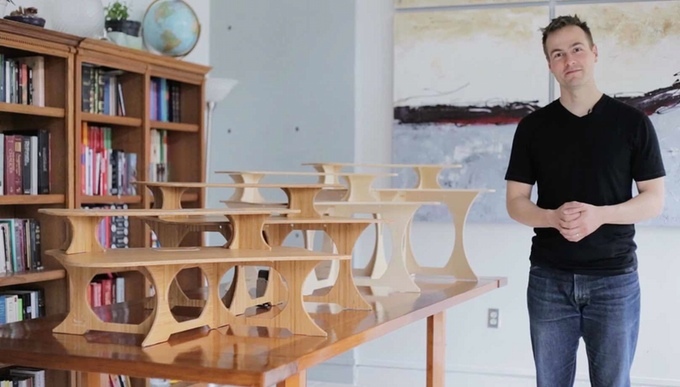 This video, which Luke stars in, shows you how easy it is to setup and use these desks. StandStand desks have legs of a fixed height. When you setup the desk the legs go under it and they are not adjustable. There isn’t a simple way to modify them either. This means that you need to order the correct desk height the first time. Luke provides simple guidance on the height of desk to order based on you height. This will be accurate for 95% of the population. If you have significantly longer or shorter arms than others of your height you may need to make an adjustment. If you have any question about what to order, contact Luke and his team on the website. This is a super cool standing desk. It is portable, though not nearly as portable as the other products in the line. As it provides that portability it gives up on some stability due to its size. It’s not going to tip but it does move a little bit as you type. In Luke’s typical fashion, the Grand got its start on Kickstarter. If you’re in to the origin of things be sure to check out the history here. Luke has an excellent Kickstarter track record, delivers quickly, and reliably. The Grand has plenty of space for you to use. You can easily put two monitors on it, a keyboard, a mouse, a coffee cup, random papers, an office plant, and whatever else you would typically have with you. It also looks very trendy with its curves, the token StandStand logo cut in to the desk, and the bamboo grains. Everyone who sees me use this desk asks about it. Note that the StandStand is not adjustable. So, if you want to switch from sitting to standing and keep your setup the same, this is not the product for you. 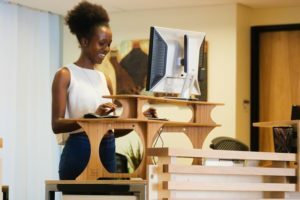 Check out the Varidesk line or other adjustable sit-stand desks for better options. The way I use it is my home-base. When I want monitors and keyboard in a standing position I swing over to the StandStand Grand workstation I have setup. When I just want to sit or lounge and use my laptop I find another place to sit. I recommend the Grand for its looks and portability. If you need an adjustable desk then this is not the product for you. The second Kickstarter campaign that Luke embarked on was for the StandStand Mouse. In his second campaign 77 people pledged over $10,000 to get this product off the ground. Again, product delivery was smooth with Luke continuing his USA manufacturing relationships and scaling up his business for this additional product. The StandStand Mouse is an excellent addition to the StandStand. I prefer to use a mouse with my laptop and this desk allows for just that. 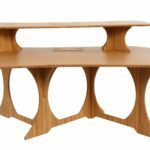 This is not an adjustable desk if you’re considering products by Varidesk or Halter or Rocelco, however it is portable and packs flat, unlike almost all other mainstream products available. When I used it I found it to be stable, strong, have a great look, and people wanted to know what it was. I found myself needing to avoid eye contact to keep from entering in to another conversation about it. I recommend this product if you need a portable standing option and you prefer a mouse, though it is not so portable as the original. 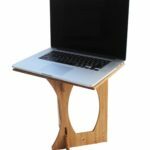 The StandStand started it all on Kickstarter. Luke attracted over 1800 backers and raised over $118,000 to get the company started. Product delivery was smoother than most Kickstarters I’ve seen and customers continue to buy the product from the StandStand website. 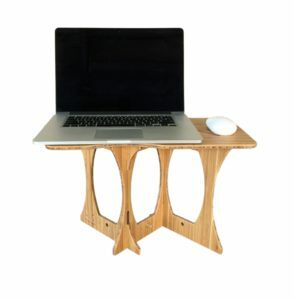 Weighing around 2 pounds (depending on the height you order) and packing flat, this desk is great at moving around town. It’s dimensions are about the same as a 17″ laptop so if you have a medium to large laptop bag it will slide right in. Setup takes about 10 seconds when you want to get your laptop on it. Before I was able to use the StandStand I was concerned about its stability with my 17″ lenovo sitting on top of it. My very first use the concern was wiped away. Yes, if you bump it strongly from the side it will tip over. No, typical use is nothing to be concerned about. There is no point in me providing the detailed specifications here when they are simple to understand on the website. I recommend this product if you want to stand and you need portability! Thank you to Luke at StandStand for providing these products so that I could review them for you based on my actual experience!